Now that I am home again with my family I can fully process all of the incredible experiences that I had during my challenge. I had so many fantastic moments on the road and met so many inspiring people with Parkinson’s, their friends and families. Some were simply people that could relate to my mission, which was to increase awareness for Parkinson’s and connect patients across borders. Meeting many other people with Parkinson’s and getting their support will give me energy and strength for the future. 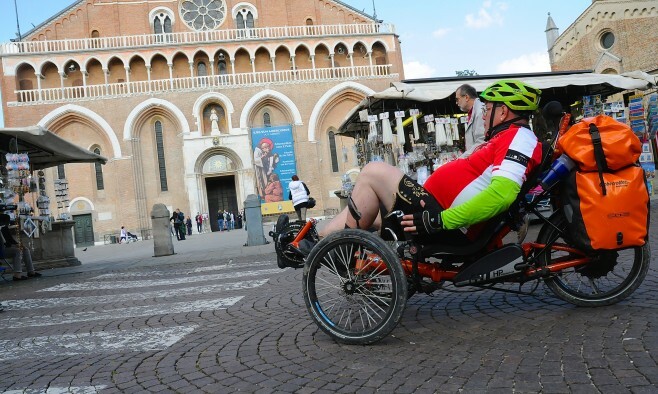 In Padua I met somebody who has lived with Parkinson’s for eight years now. He treats the disease as his life companion in the good times and the bad. Thanks to his unremitting willpower he hasn’t ever given up trying to continue living life as he knew it pre-diagnosis in all these years. On another day, we encountered a couple from Germany who were travelling by bike from Sicily, Italy, to the North Cape, Norway. Maybe that could be one of my next destinations! However, none of this would have been possible without the support of so many strong people, among them my wife Christiane, my tour companions Alexandra Pauler and Benno Lex and all of the local patient associations. It has truly been an overwhelming experience to encounter so many warm welcomes and receive so much encouragement on the road. I hope that I can also encourage other people, showing them that you should never give up, and that a normal guy like me can set big things in motion.